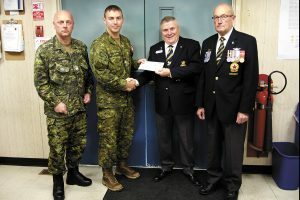 From left: Warrant Officer Mike Clarke and Master Corporal Todd Clark from 77 Line Regiment, present a $400 donation to Cockrell House Chairman Angus Stanfield and Resident Manager Rick Nicholson. Representatives from Cockrell House visited Dockyard Sept. 25 to accept a $400 donation from Canadian Forces 77 Line Regiment. The 13-member unit that employs 11 military personnel and two civilians is part of the army’s Communications and Electronics Branch, 3 Line Squadron, and handles the lion’s share of the cable and antenna maintenance at the base and other DND properties on the lower mainland and southern Vancouver Island. Over the past six months members of Regiment collected $2 donations from a “dress-down Friday” event and other fundraising initiatives to provide financial assistance to the Colwood-based non-profit, which provides transitional housing to homeless and at-risk veterans. The 11-bed multiplex unit provides housing, counselling, life skills health and social services and transportation to over 50 residents since it opened in 2009. Cockrell House receives its funding from the Royal Canadian Legion BC/Yukon Command, the Legion Foundation, other veteran organizations, and the City of Colwood. Stanfield, a past president of the Legion’s BC/Yukon Command, said the money raised will be used to pay for bus passes and $100 food cards for residents. Warrant Officer, Mike Clarke, Regional Assistant Line Communications Superintendent, said supporting Cockrell House was a natural for himself and other members of the unit. Following the cheque presentation held at the unit’s Local Line Work Centre, Stanfield presented members of the unit with a certificate of appreciation for their efforts in supporting Cockrell House.